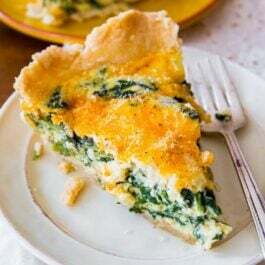 This cheesy spinach quiche uses my favorite quiche recipe as the base. It’s savory, creamy, and baked in a deliciously flaky homemade pie crust. Impress all your guests with this brunch recipe! Earlier this month, we went over my future sister-in-law’s house for brunch. She is one of my favorite cooks! I always find recipe inspiration when she cooks for the family. For brunch, she made two quiches: one spinach and one mushroom. I’ve been dreaming about remaking her quiches the whole month! I couldn’t decide between her spinach quiche or mushroom quiche, so I combined them into one. One ultra cheesy, ultra savory, peppered, mushroom, spinach fiesta. I baked it all in my favorite super flaky pie crust. So, what is quiche? 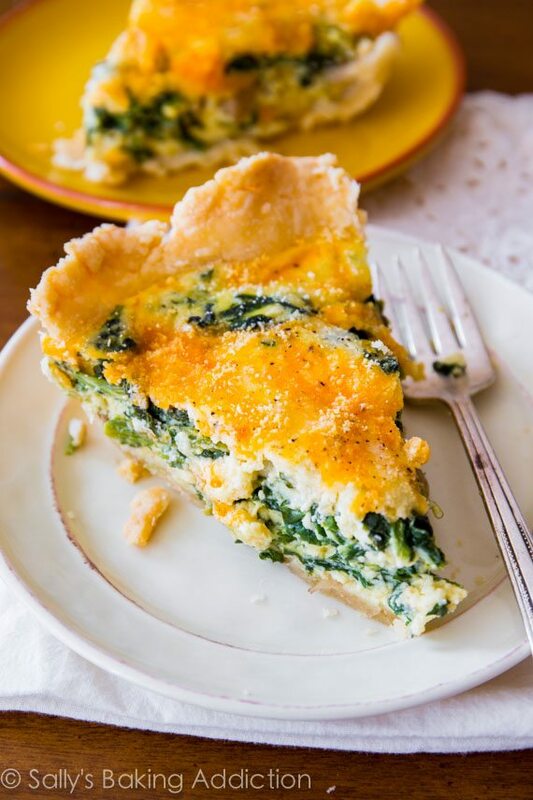 Quiche is an egg and milk custard filled with all sorts of extras like cheese and veggies. 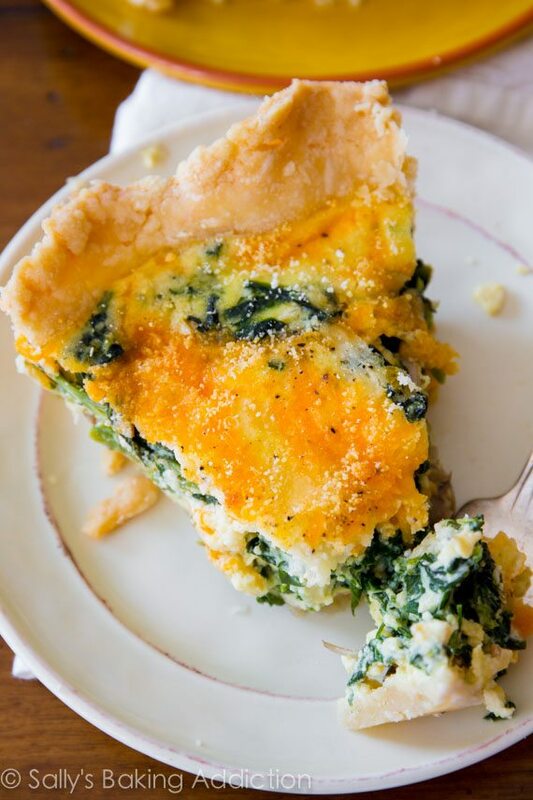 Traditionally, quiches are baked in a pie crust. Any excuse I have to make my buttery, flaky pie crust, I do it. 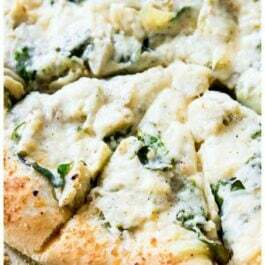 My version uses eggs, whole milk (for an extra creamy texture), cheddar/mozzarella cheeses, parmesan cheese, frozen spinach, garlic, and mushrooms. The key to preventing a soggy quiche is to reduce the moisture in your vegetables. The mushrooms are cooked down with the minced garlic, salt, and pepper. The garlic gives them a little something extra. I cook the mushrooms down to rid them of their moisture. Those things are like sponges holding on dearly for water! You don’t want that. 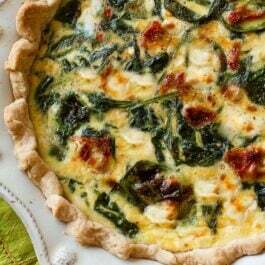 I use frozen spinach in my quiche for ease, though fresh would be fine. But my piece of advice? Avoid the hassle and buy a block of frozen! It’s cheaper, less messy, and easier. Make sure you drain your spinach extra well. Thawed frozen spinach is full of water and you’ll want to blot it as much as you can. 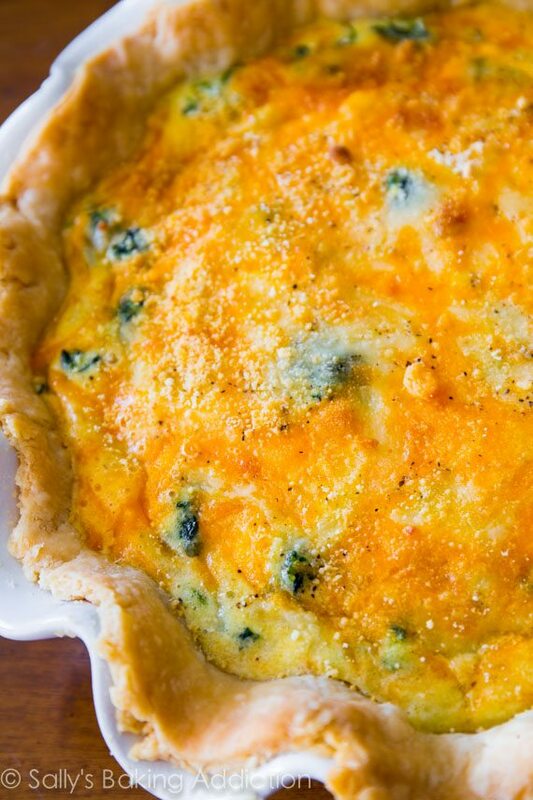 Creamy and thick, my cheesy egg base will give your quiche the most luxurious texture. During all this time, your homemade pie crust has been chilling. Do yourself a favor and make it the night ahead of time. That’s exactly what I did on Sunday. Then, all you have to do in the morning is roll it out, pre-bake it for a few minutes and add the veggies, cheeses, and egg mixture on top. And hey, while you’re at it – thaw the spinach and sauté the mushrooms the night before too. We all have hectic schedules, especially in the morning or while entertaining. Save time where you can! Bake the quiche until it is golden brown on top and the center is no longer liquid. All ovens are different and this could take anywhere from 45 minutes to 1 hour. Start checking around 40 minutes. As the quiche nears its final minutes in the oven, it will begin to puff up. Once you remove it from the oven, it will slightly deflate. My cheesy spinach quiche took 50 minutes. I like it extra toasty on top. Let it cool for a few minutes, then slice → serve → eat → cheesy heaven. The best part about quiche is that the possibilities are endless! Use your favorite cheeses like feta, goat cheese, mozzarella, swiss. For some smoky flavor, try adding some bacon crumbles. You could even add some chopped onions, red peppers, or artichokes. How to Bake the Perfect Quiche – wonderful resource for all quiche baking! 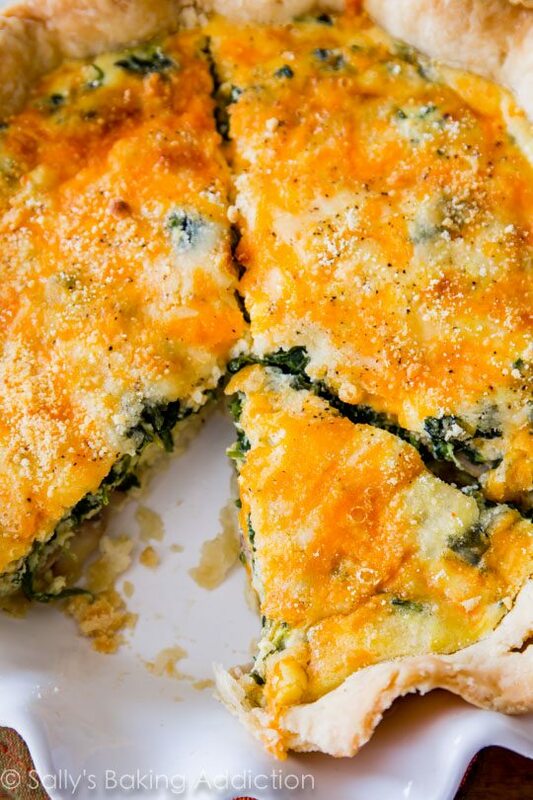 Impress all your guests with this classic and always impressive cheesy spinach quiche recipe. For best results, bake it in a super flaky homemade pie crust. See more cheese options in the recipe notes. Try adding some bacon crumbles or your favorite mixed veggies. Pie crust: I like to make sure my pie dough is prepared before I begin the quiche. Make pie dough the night before because it needs to chill in the refrigerator for at least 2 hours before rolling out and blind baking (next step). Reduce oven temperature to 350°F (177°C). If your frozen spinach is not already thawed, thaw it in the microwave per box directions. Drain the spinach in a colander while you prepare the rest of the ingredients. 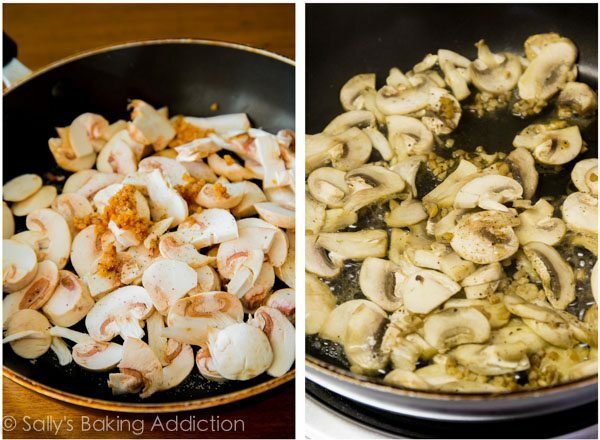 Place sliced mushrooms in a skillet coated with 1 teaspoon olive oil or nonstick spray, add the garlic, and a sprinkle of salt and pepper. Turn the heat on to medium-high and sauté the mushrooms until they release all of their moisture and no more water remains on the bottom of the skillet, about 6-7 minutes. Whisk the eggs, milk, and parmesan cheese together until combined. Sprinkle with a pinch of salt and pepper. Set aside. Blot and squeeze the rest of the water out of the thawed spinach. Spread spinach on warm pre-baked pie crust. Add the cooked mushrooms and shredded cheeses. Pour the egg mixture on top. If desired, sprinkle the top lightly with more parmesan cheese and/or salt and pepper. Bake the quiche until the center is just about set, about 50-60 minutes. Don't over-bake. Use a pie crust shield to prevent the pie crust edges from over-browning. Allow to cool for 15 minutes before slicing and serving. 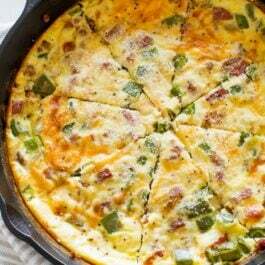 Or you can cool the quiche completely before serving-- it's fantastic at room temperature! 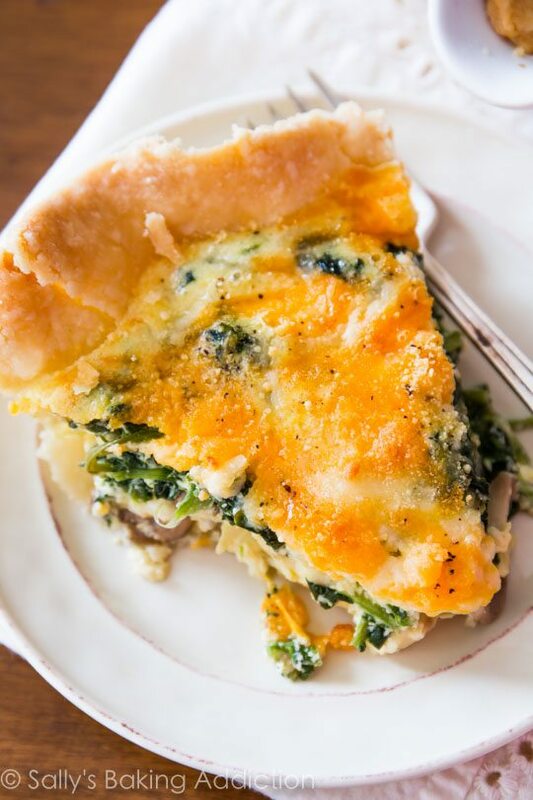 This quiche makes great leftovers! Cover tightly and store in the refrigerator for up to 4 days. Make Ahead & Freezing Instructions: The pie dough can be prepared ahead of time and stored in the refrigerator for up to 5 days or in the freezer for up to 3 months. You can pre-bake the crust ahead of time too. See end of step 2. To freeze, cool baked quiche completely, then cover tightly with a couple sheets of aluminum foil and freeze for up to 3 months. Thaw in the refrigerator or on the counter, then bake at 350°F (177°C) for 20-25 minutes. Pie Crust: My pie crust recipe makes enough dough for two quiches. You can make half of the recipe or make the entire recipe and freeze half of the dough for another quiche, or bake two quiches. The dough can be stored in the refrigerator for up to 5 days or in the freezer for up to 3 months. Thaw overnight in the refrigerator before using. Spinach: You can use fresh spinach instead. I would use about 3 packed cups of fresh. You can cook it down ahead of time, or just add it fresh. Here is how I make quiche with cooked down fresh spinach. Milk: Whole milk is preferred for creamiest texture, but 1/2 cup heavy cream and 1/2 cup whole milk is fantastic too. You could also substitute half-and-half. See How to Bake the Perfect Quiche post. Cheese: Use 1 cup total of your favorite cheeses, for example 1/2 cup cheddar cheese and 1/2 cup feta cheese. Or 1/3 cup goat cheese, 2/3 cup mozzarella. Or 1/2 cup Swiss cheese and 1/2 cup cheddar. Get creative!